Catch up on all the latest Lemon Recipe videos by clicking in the above player. When you think about it, lemons are the perfect fruit. Always available, reasonably priced, consistent quality, long lasting, good looking, outside as valuable as inside, enhances the ingredients it comes in contact with, and is just as useful in cooking as it is in baking. And if that weren't enough, its virtues within the household are many. Margaret Visser in 'Much Depends on Dinner' tells how it is used as a bleach, a cleaner for wood furniture and silver, a remedy for sore throats, upset stomachs, asthma, and even rheumatism. Women as far back as Louis XIV's court used to eat lemons to freshen their breath and redden their lips. Waverley Root in 'Food' tells of the Roman belief that eating a lemon is the antidote for all poisons. He tells the story of how two criminals were said to have been thrown to venomous snakes but how the one criminal who had eaten a lemon beforehand survived the snake bites. Long before we knew that lemons contained Vitamin C, sailors ate them on long sea voyages to prevent scurvy. Christopher Columbus carried lemon seeds on his travels to the New World and planted them when he stopped in Haiti. The Portuguese are credited with bringing the lemon to Brazil (about 1540) and the Spaniards for bringing it to Florida (about 1565). By the 1730s Spanish Friars had started to grow lemons in California and by the 1850s cultivation in California was widespread. In fact, California has such perfect growing conditions that it now produces most of the lemons sold in North America. Unlike apples and oranges, lemons are almost never labeled by variety. There are, in fact, two popular commercial types; the Eureka and the Lisbon. Producers probably don't bother labeling the varieties because they are so similar in size, color, and acidity. The beauty of the lemon is that its outer skin (rind) is just as valuable as its juice. The skin contains the lemon's oils and perfumes and even before we had graters, Elizabeth David's in "An Omelette and a Glass of Wine" said that "one of the best lemon graters is lump sugar, although Hannah Glasse (The Art of Cookery Made Plain and Easy, 1747) directed her readers to grate lemon skins with a piece of broken glass". When buying lemons always keep in mind when you want the lemon's zest to look for lemons that have a rough thick outer skin. 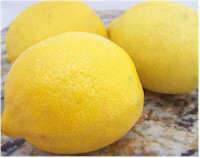 These lemons have lots of zest that is easier to remove than it is with thin skinned lemons. No matter the time of year lemon desserts are always welcome. They are just as refreshing in the heat of summer as they are after a heavy winter's meal. Here are a few of my favorite lemon desserts. Kiple, Kenneth F. and Ornelas, Kriemhild Cone?/font>, The Cambridge World History of Food. Cambridge, Cambridge University Press, 2000. Visser, Margaret, Much Depends on Dinner. New York: Grove Press, 1986.